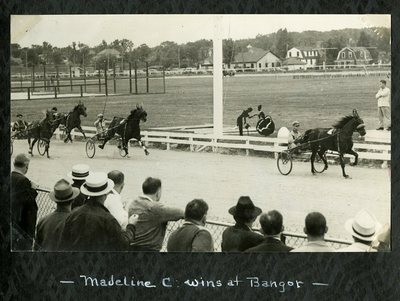 Black and white photograph of bay filly Madeline C. wearing head number two, Utton up, winning the second heat of the Two Year Old Colt Pace at Bass Park in Bangor, Maine on Thursday, August 1, 1940. Pictured coming in second is Volo H., Wathen up wearing head number four followed by Opal G., Rowe up, and Honey Belwin, Carpenter up. In the background of the photograph shows houses in the Buck Street neighborhood adjacent to the Bass Park property.